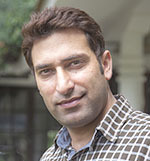 Mr Muhammad Sohail joined ICIMOD at its Pakistan Office in May 2012 as the National REDD+ Project Manager. After successful completion of the project in October 2013, he had been working as Coordinator REDD+ and NRM and was based in Islamabad. Sohail moved to Kathmandu in September 2014 and joined his new position as REDD+ Specialist under the Theme Ecosystem Services at the ICIMOD headquarters. Prior to joining ICIMOD, Sohail was member of the expert group that formulated Pakistan’s National Climate Change Policy (NCCP) in joint collaboration with the United Nations and the Climate Change Division, Government of Pakistan. Sohail has also worked with WWF-Pakistan on carbon stock assessment and has developed proposals for undertaking similar studies in Ayubia National Park, Pakistan. He also has working experience as a consultant on carbon forestry and climate change in the Netherlands and Malaysia; and as a Guest Researcher on European forests and climate change-related policies at the International Institute for Applied Systems Analysis (IIASA), Austria. Sohail has grown interest in climate change mitigation options with particular focus on reducing emissions from deforestation and forest degradation (REDD). He graduated from the Pakistan Forest Institute, holds a master’s degree in European Forestry from Joensuu University, Finland, and holds a second master’s degree from Wageningen University, the Netherlands, where he specialized in Forest and Nature Conservation Policy. His M.Sc. thesis focused on political aspects and identifying the underlying factors and interests of ‘actors’ that are active in the ‘game’ of climate change mitigation.